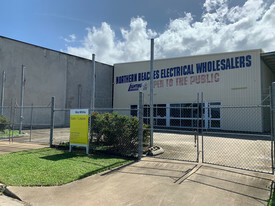 Available now this property offers a multitude of uses and options for the tenant seeking a prominent industrial location with a functional layout, quality buildings and modern offices and amenities. Consisting of a main warehouse/factory/modern offices at front, an additional modern shed at rear plus a four bay garage and ample hardstand behind a large steel gated entry. This Redden street property is on a wide road and accessed from a major arterial road in the immediate rail and seaport precinct. * Direct floor access to workers amenities – toilet/modern air conditioned lunchroom. * Upstairs of Main Shed and modern offices – 35m2 carpeted and air- conditioned boardroom plus two additional areas of clear office or storage space. 1 area 74m and the other 67m2. * Ideal for an expanding business or additional storage requirement. * New LED high bay lighting and separate florescent lighting under mezzanine. House located on the property (approx 400sqm of the total land area) to the side. Whilst the house is not forming part of the lease it does inadvertently provide security for the property with a tenant residing in the house. The tenant does not use access or any parking or lettable part of the property offered for lease. The positioning of the house on the block allows it to act as completely separate property, with separately metered electricity and water. The tenant has been a long term tenant however should they ever wish to vacate the house could be offered as a lease addition.